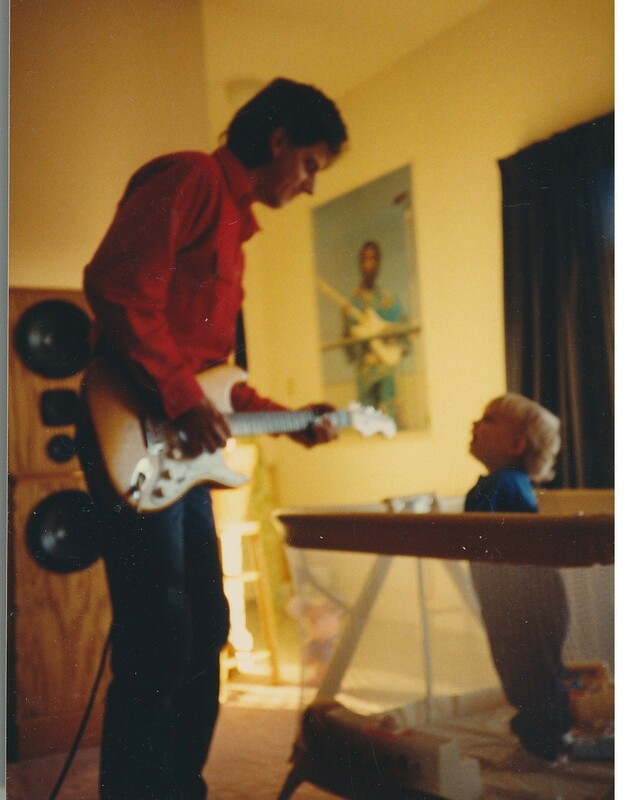 My dad and my baby brother, circa 1989, with Jimi between them. 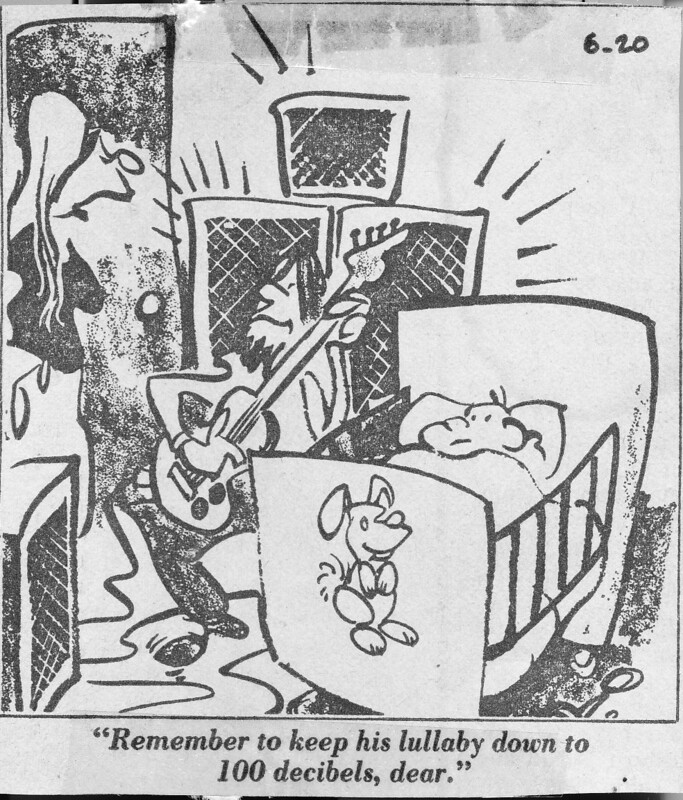 My mom taped this cartoon into my baby book in 1979. My lullabies were 110 decibel Led Zeppelin songs. My dad didn’t turn it down for bedtime. I sang along to lyrics that were naughtier than I knew. (But I also changed the lyrics to fit my childhood brain.) I heard my name in “Good Times Bad Times”. I swear, from a very young age, I heard my mom and/or Robert Plant screaming my name in that one. By the age of seven or eight, I knew the difference between 1970s Rolling Stones and 1980s Rolling Stones. I could tell the difference between the Beatles and George Harrison’s solo work. I had seen Roy Orbison perform. I knew what a Marshall half-stack was. I could tell the difference between a Les Paul and a Strat. I inherited none of my parents’ musical talents, but I certainly have a brain full of classics and warm/odd memories. Everyone has memories attached to music and songs. But nobody, of course, has memories like mine. Hearing “Harvest Moon” makes me feel like it’s really late and I am lying in bed and my dad has put the guitar away for the night. He’s just sitting on the couch with my mom while the vinyl spins. Hearing “Cinnamon Girl” makes me feel like it’s a Saturday afternoon band practice and I am watching the band from our basement steps. The music is so loud that my heart is vibrating, just like at a concert. Sometimes the toaster vibrated across the kitchen counter, and one time it walked right off the counter. My childhood was so loud. My mom and I couldn’t answer the kitchen phone, because we couldn’t hear a thing anyone said anyway. We watched a lot of TV shows on mute, because there was no point in having sound. Each TV show had a classic rock soundtrack. We didn’t mind at all – it was just the way it was. When we gave up answering the phone or watching muted TV, we would just sit in the music room and watch my dad practice. My mom and I snuggled on a chair together while he played. I remember sucking my thumb (which I stopped doing on my fourth birthday) while cuddling my mom before bed. My dad was playing guitar and the enormous sound was everywhere, in my whole body. That was relaxing to me. That was how I got sleepy for bed. My parents never treated music as “background” to anything. 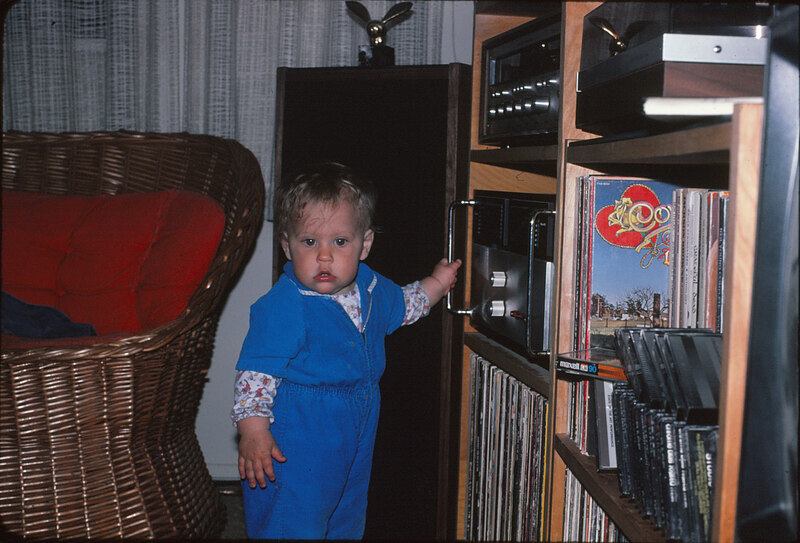 Music was something that was enjoyed first-person in our house. It deserved to be the focus of our attention. It deserved to be loud. It deserved to be the featured guest. Besides, playing it quietly makes you miss some of the good stuff. Have you ever heard the beginning of “Time” by Pink Floyd really really loudly? Well, I have. Whenever my dad tested his speaker systems, he put that clock-ticking intro on to calibrate something, I think. The booming bass would shake my little skinny kid body, and I loved it. My handmade sound system and small record collection, protected from my “quadruplets”. My dad built speaker systems from scratch. He was a carpenter by trade, and carried his skills over into his love for music. He never had any musical training, as far as I know, but he has audiophile ears and a craftsman’s hands that can build speaker systems to blow-dry your hair – and still make you hear ticking clocks like never before. 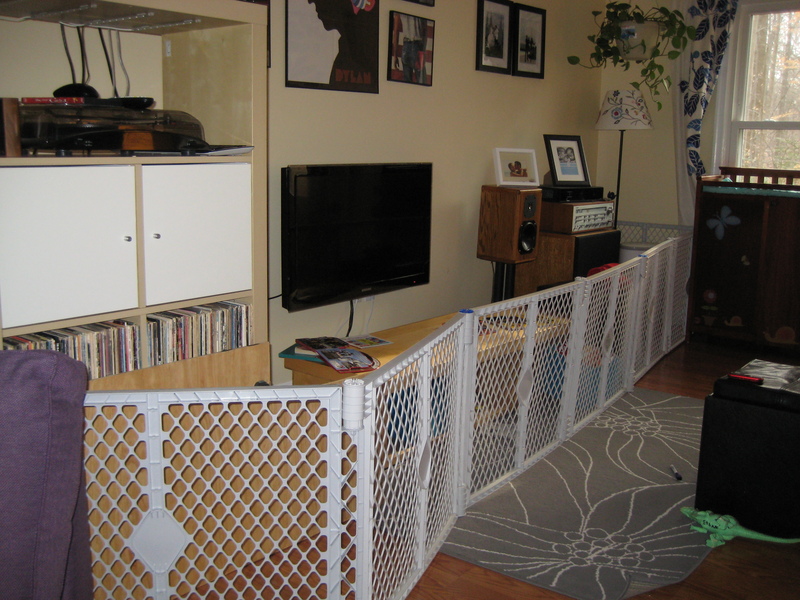 He designed his music room to have optimal acoustics, and then built it. As an adult in my own home, I have custom-built speakers and a subwoofer, built as presents by my own dad. They are definitely gated off from my “quadruplets”. My husband loves my record collection and our homemade sound system. Of course, my record collection is itty-bitty, compared to my father’s. It’s just a sampling, really. I gathered it over many flea-market and thrift-store scavenges with my dad, when I was in high school in the 90s. I take great pride in my little collection. I have one problem: I don’t play it. My husband realized early on in our marriage that I had this strange habit of waiting for him to select the music. It’s a very odd habit that I seemed to have formed from being the offspring of a musician. Apparently, I wait for a man to DJ my life. Not proud of that, but, there it is. I love vinyl. I’m no musician, but I can hear at least some of the sound quality, and I love it. 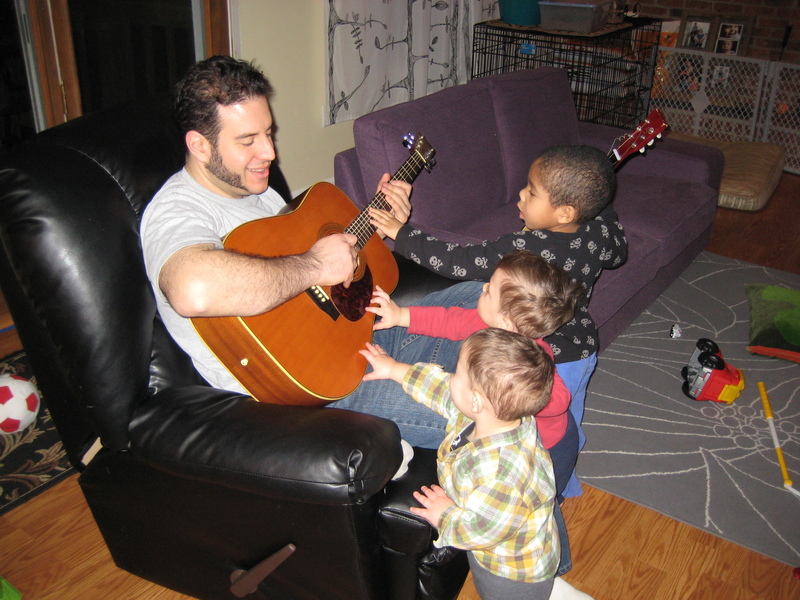 However, I have no idea how to make music be the featured guest in my house of four children, ages four and under. They are always the featured guests. There is no sitting still to listen to the subtleties of music, and I miss that. However, we do have “dance party” several times a week, where we blast some compressed digital files through the homemade subwoofer (again, my apologies to Dad and Neil Young), and the kids dance with me until we fall down. They especially seem to like Black Keys and Black Sabbath right now. My kids may not have as many musical memories as I do. They may not know the difference between a Les Paul and a Strat. They may not have 110 decibel Zeppelin lullabies. But, they do know how to headbang as soon as they can stand. They do know how to treat a guitar with respect as soon as they can walk. They do stop whatever they are doing when their father breaks out the acoustic. They probably won’t know what a CD is, but they already know what a vinyl records does. Let’s just hope they can hear the difference! I love this post. My childhood memories also revolve around music. Hearing the Talking Heads brings me back to road trips to grandma’s house, Paul Simon’s Graceland will forever remind me of twirling in the living room before my dad drove me to ballet class, and most Beatles songs remind me of sing-alongs wiith my mom. I have some good Talking Heads memories as well! Glad you liked the post! Thanks for reading. So interesting to think what our babies’ musical memories will be. Great post. Agreed! Maybe I will be lucky enough that one of my kids will write about it in thirty years! Thanks for sharing! It’s heartwarming to see how many of our generation has memories like this from our parents.